Summer is in full swing and has been basking us with glorious sunshine for a good couple of weeks now! My favourite thing to do during these Summer months is dine outside on the warm hazy nights with a joyous group of close friends or family. For me there’s nothing better than a table full of Summery dishes, a few chilled Appletisers and the company of my closest friends to end a scorching day. This month, I’ve teamed up with Appletiser to recreate one of my favourite dishes: an easy to cook, staple Summer dish. Inspired by a few dinners I’ve enjoyed with my those closest to me in my back garden. This recipe harnesses the spice in the chicken and balances it with the fresh and fruity flavours in Appletiser. 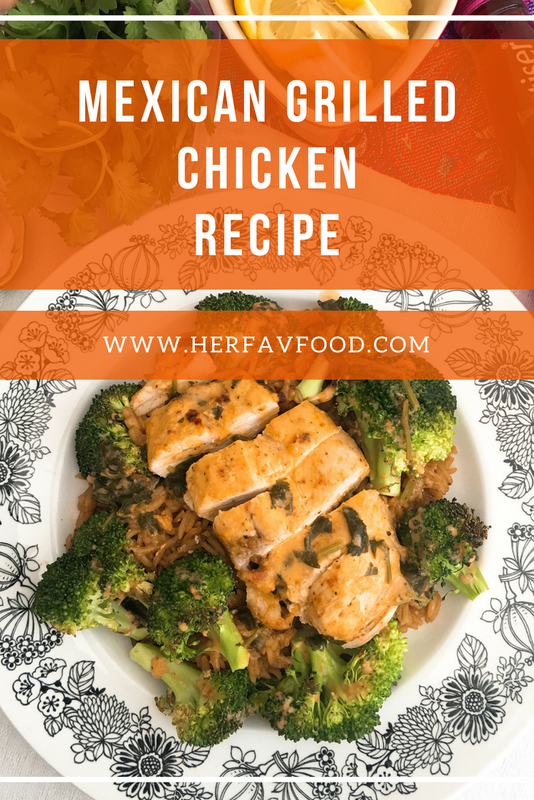 The recipe doesn’t need too many ingredients and can be cooked from scratch in 40mins; the generous portion of broccoli also contains at least one of your 5-a-day! 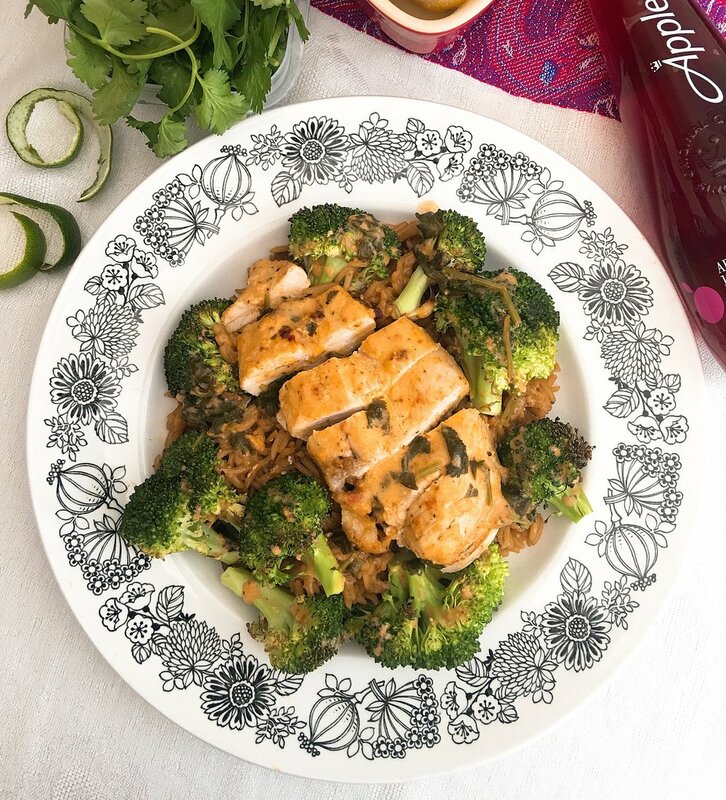 This Mexican spiced chicken dish paired with a chilled Appletiser makes the perfect combination in this fabulous Summer sunshine! Preheat the oven to 200 degrees and put water on the boil for the wild rice. Add the chicken to a mixing bowl and season with salt and pepper. Sprinkle the Mexican spice mix and one third of the coconut milk over the chicken, marinate and leave to rest for minimum 30mins. When the water is boiling, add the rice, as well as half of the chicken stock and a pinch of salt. Cook until tender. Whilst rice is cooking, separate the broccoli into florets, chop the garlic, and roughly chop the coriander. Also zest and juice the lemon. Heat a frying pan and cook the marinated chicken on a high heat until evenly browned. Transfer onto a baking tray and bake for about 15-17 mins. When the chicken has 10mins left, add the broccoli and continue cooking. Next, make the stock using half a glass of water and the remaining stock, coconut milk and Mexican spice mix. Bring to the boil and allow to simmer for about 4-5mins. Add the lemon juice and lemon zest as well as the coriander. Season with salt and pepper. When the rice is cooked drain the water and serve on a plate. Slice the cooked chicken into 5 or 6 pieces and serve on top of the rice. 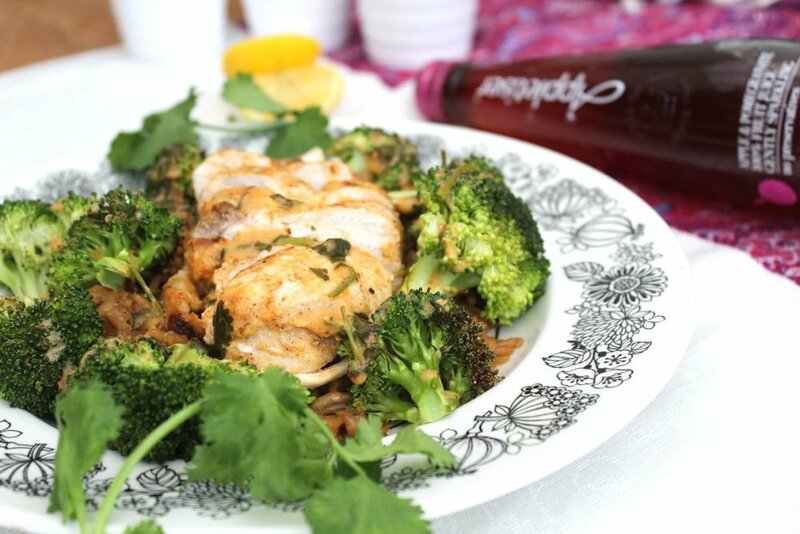 Finish with the roasted broccoli and coconut sauce served on top. Enjoy with a glass of chilled Appletiser in the Summer sunshine! Why not try this Mexican spiced chicken recipe yourself? Let me know how you find it!